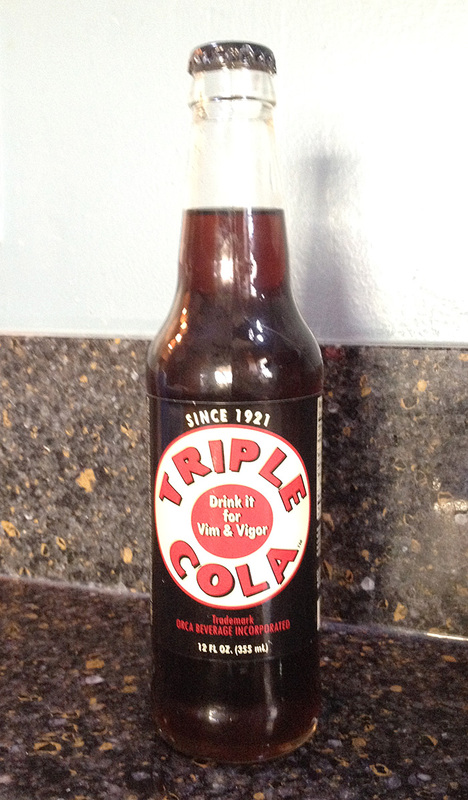 Review: The label said "Drink it for Vim & Vigor," but it didn't give me either of those things. I've had a lot of good colas lately, but this wasn't one of them. 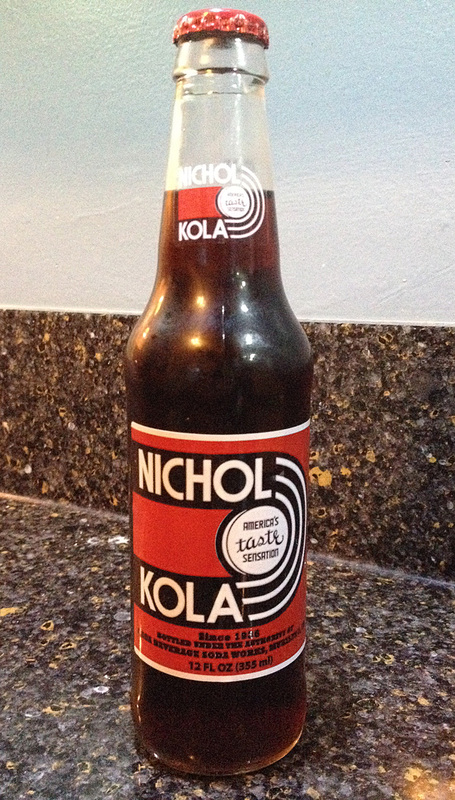 It was a bit bland and weak, with a slightly "off" aftertaste - almost the slightly "burnt" taste that not-so-great colas can have. Not good. On my "instructor station" at class. Sweetener: High Fructose Corn Sweetener. Review: This was really smooth and creamy. There's a bit of a caramel hint that just nearly verges on being too much for me. If you like a bit of caramel in a smooth root beer, then give this a try. It was pretty decent. Brand: Hippo Size Colossal Cream. Review: This was super creamy, but had a bit of a sharp "unnatural" flavor. The creaminess came at the start of the sip, and the sharpness came at the end. It wasn't the best. 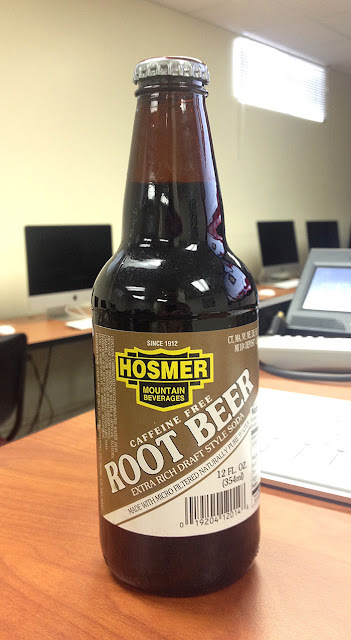 One of my favorite root beers is Hippo Size Root Beer, but this wasn't nearly as good. I'll give it an smack-in-the-middle score. Purchase Place: "Frattallone's Ace Hardware," St. Paul, MN. Review: I've started to realize that I like a "good" cola. And this is a good cola. It had a good, deep flavor, and some interesting "kicks" as well: the ingredients listed coriander and cinnamon as well. 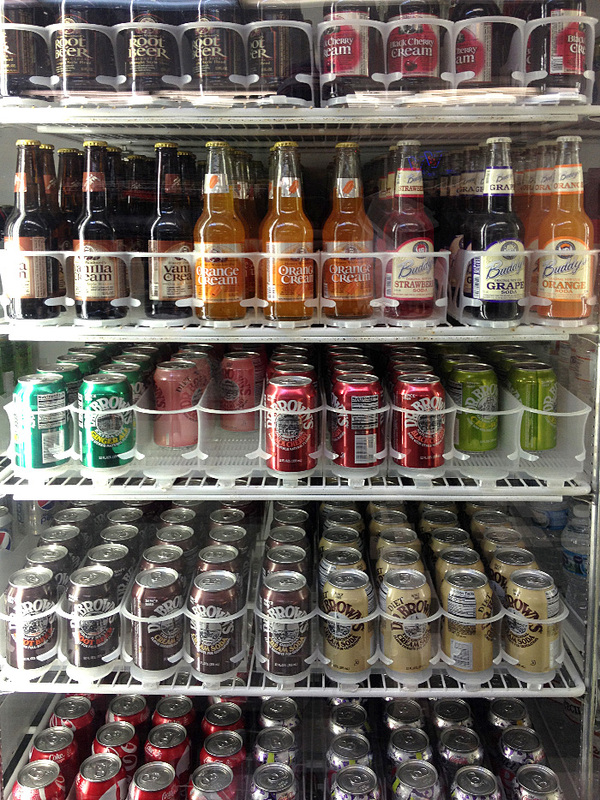 Good mix of flavors, and worth a try! 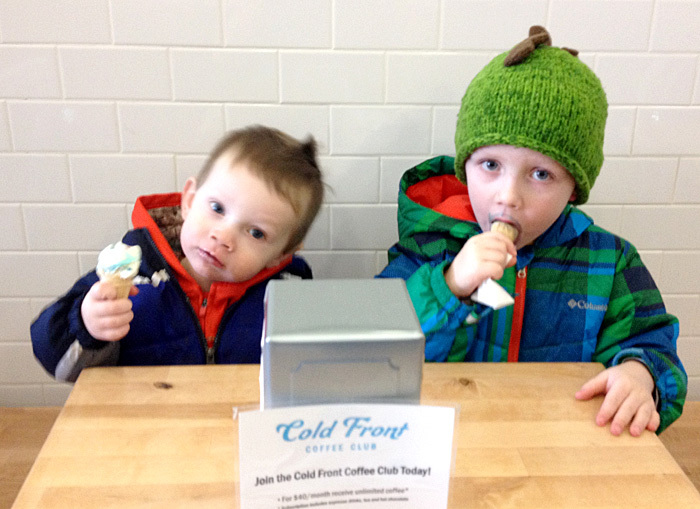 This morning, the boys and I stopped at Cold Front Soda Fountain just a few miles away here in St. Paul. 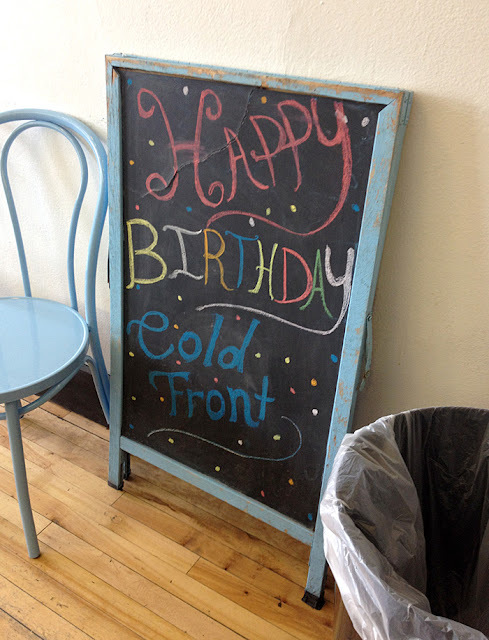 Cold Front had just celebrated it's 1-year birthday a few days ago. Birthday balloons and candy were still all over! My boys and their ice cream: "Birthday Cake" for my 1-yr-old, and "Superman" for my 4-yr-old. 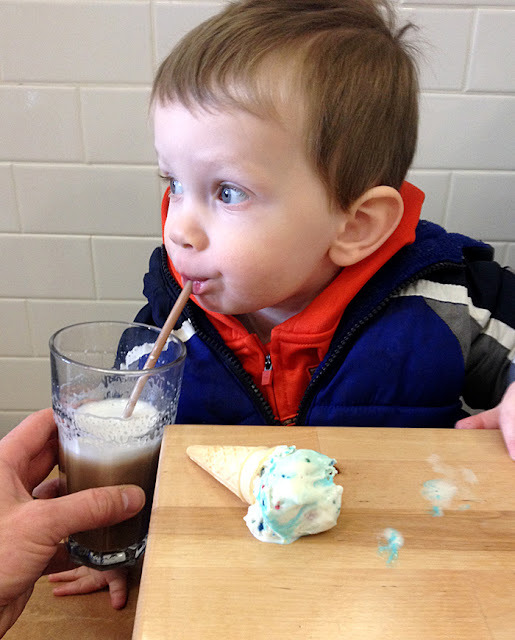 My first Egg Cream. 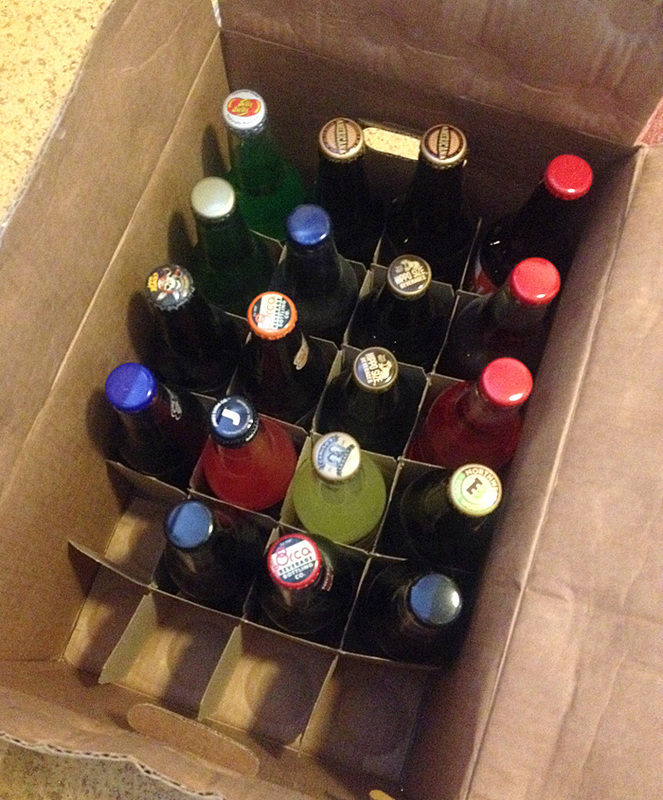 It's chocolate syrup, milk, and carbonated water. Steve (the owner) put the 3 ingredients in the glass, got our attention, and said "here's the kinda magical part." It looked just like water with milky bubbles on the top, but then he started stirring the chocolate syrup at the bottom. In just a few seconds, it transformed to what you see above. 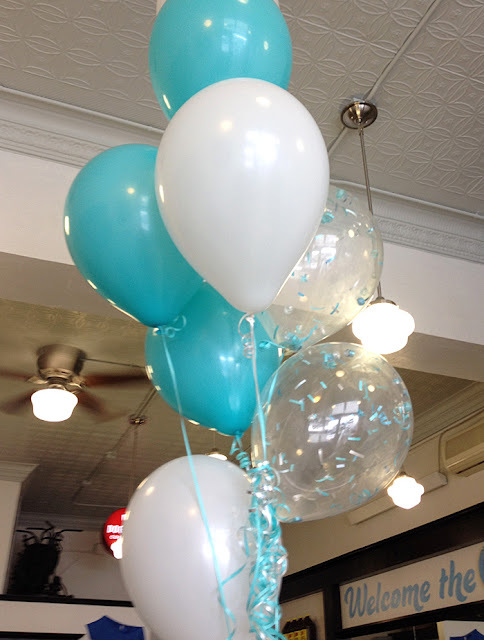 My boys drank half my Egg Cream. Really. 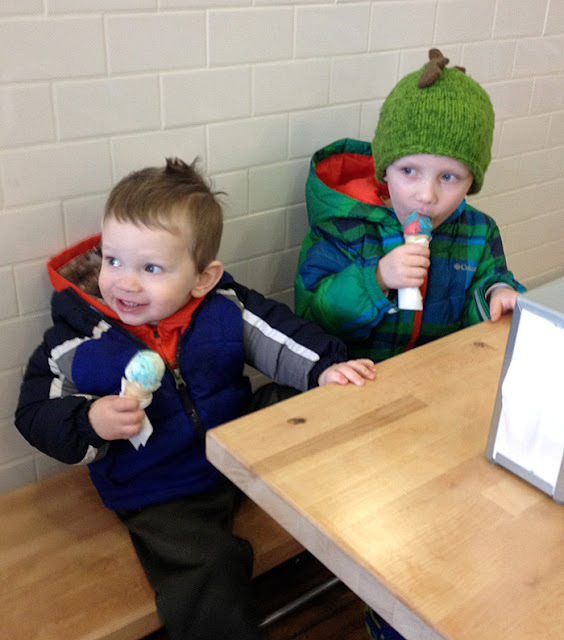 My funny dates at Cold Front. Brand: Cold Front Egg Cream. Origin: Cold Front, St. Paul, MN. Purchase Place: Cold Front, St. Paul, MN. Sweetener: High Fructose Corn Syrup and/or Sugar (according to the Fox's U-Bet Chocolate Syrup website). 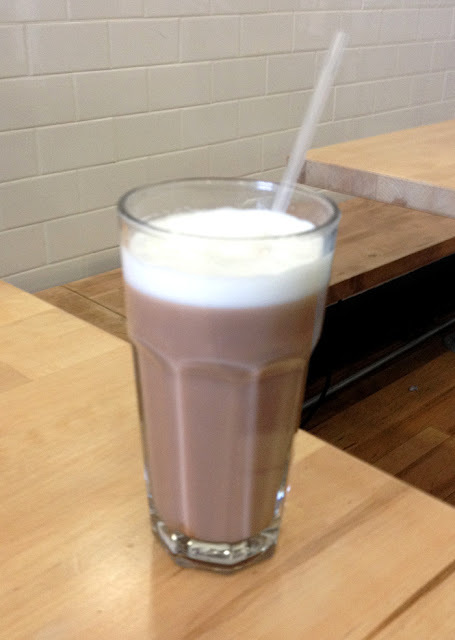 Review: The owner mentioned that this is a much lighter version of a cold chocolate milk that would be tasty on a hot day (where ACTUAL chocolate milk might be too heavy - remember "milk was a bad choice" from Anchorman?). It was like a light, refreshing, fizzy chocolate milk. It was FAR from heavy - Steve was right in saying it'd be great on a summer afternoon. Interesting flavor combo. I'll rank it just above average, and would totally have it again. 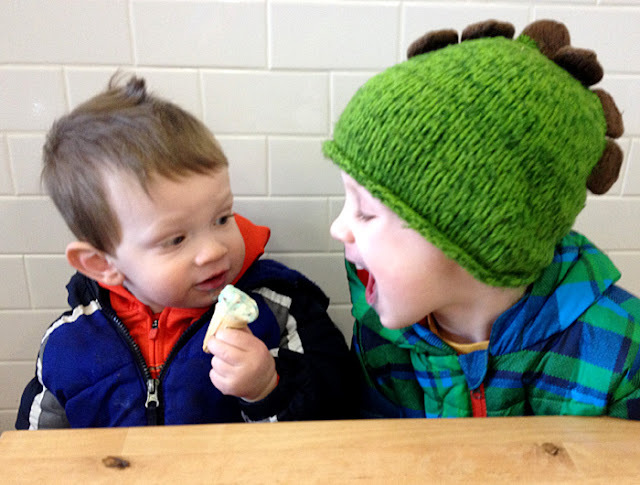 "Oh, do you want a bite of my cone?…"
"… PSYCH! It's going in MY mouth!" Kinda scribbly. But I can read it, and I guess that's all that matters. 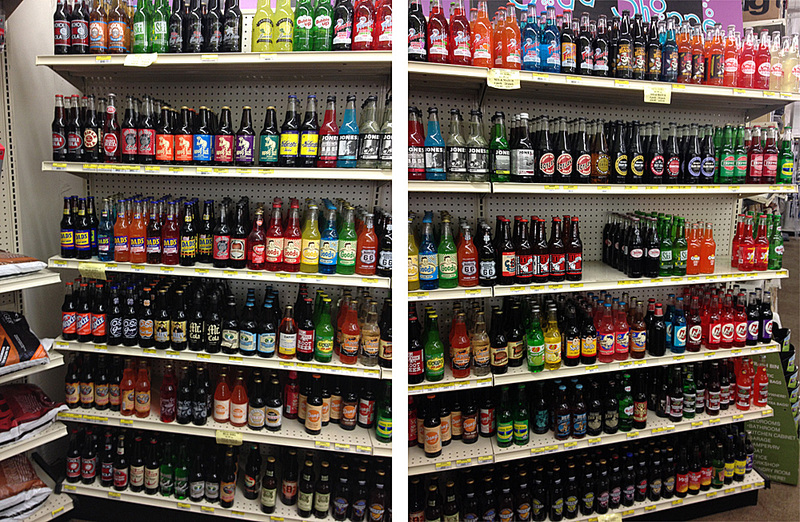 My new sodas from Ace! Combine those with my decent stash that's still left from "Minnesota's Largest Candy Store" this fall, and I should be set for many months! My soda for the evening, next to my wife's ruben (and fries). Brand: Dr. Brown's Diet Black Cherry Soda. Review: I forgot that I tried the non-diet version last year, and it wasn't the best. Well, this one was about the same. 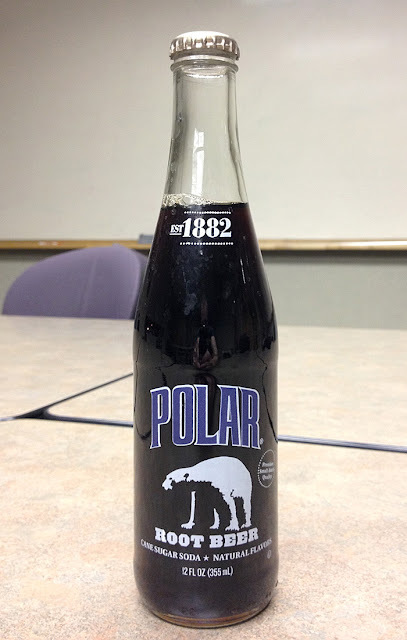 It was oddly creamy, which was strange in a black cherry soda. 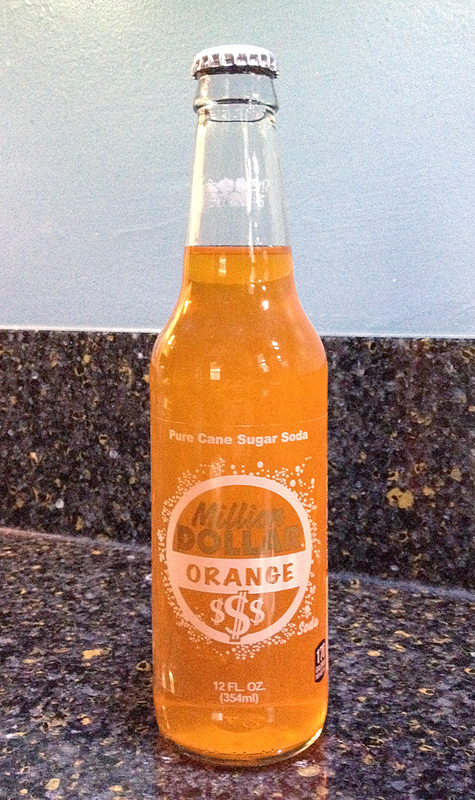 It had a decent amount of flavor for a diet soda, but the flavor was strange. It needed to be less creamy and more smooth (even though it tasted of "cream," it still had a decent "bite," and that was an odd combination). I'm giving it a slightly lower score than it's non-diet version. Review: This was OK, but nothing spectacular. It was a decent orange, but nothing stood out. 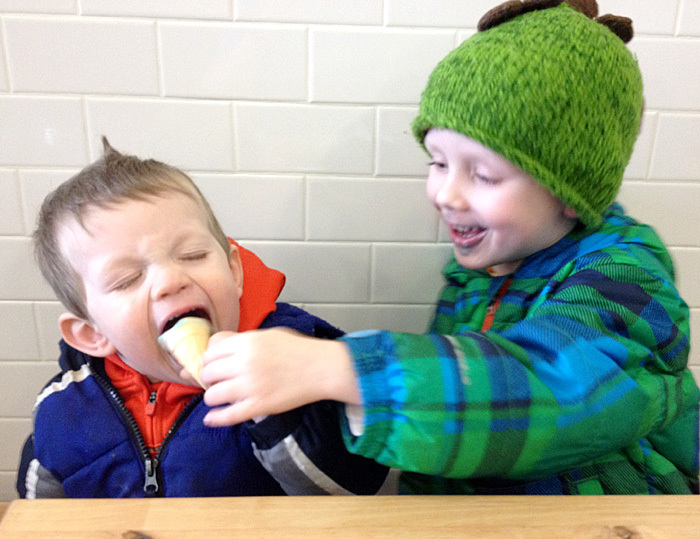 It's slightly creamy, but definitely not an "orange cream." I'll give it an average score. 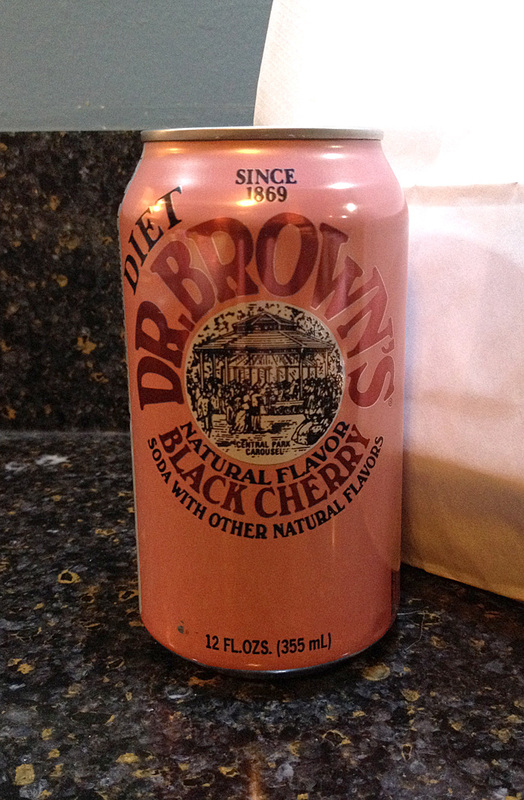 Review: This had a deep flavor, and was slightly on the thick side (without being gross). It has quite a strong caramel flavor that's maybe just a bit too much - this knocked down the score by about a full point. Pretty smooth, pretty sweet, and not bad overall. 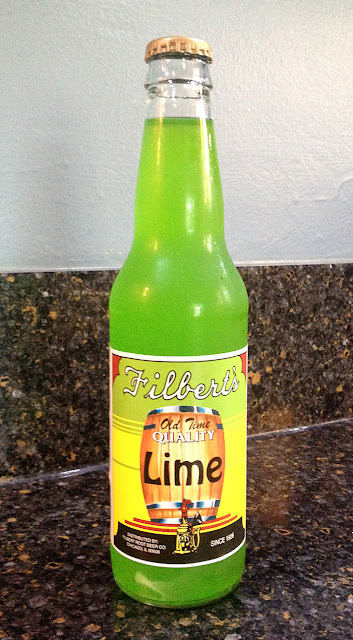 Brand: Filbert's Old Time Quality Lime. Review: For how neon this is, I was surprised that it had a nice, soft, subtle lime flavor. It wasn't over-powering, or too sugary-sweet. 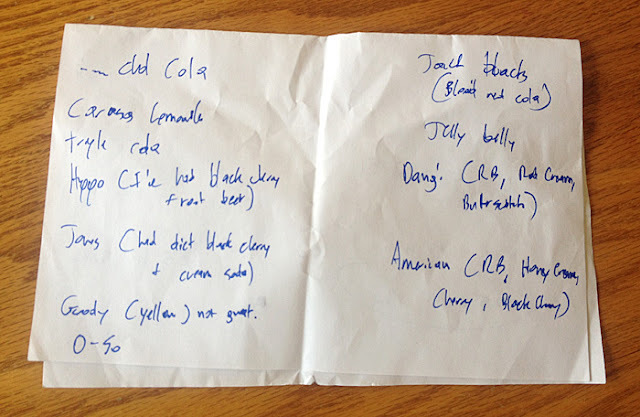 It wasn't anything fantastic or ground-breaking, but it was a simple, tasty lime soda.